Hello everyone – I know most of you are as busy as I am and always trying to figure out how to accomplish all that life brings PLUS all our crafts. Since I’ve had this business, I’ve dropped my other crafts one by one as they just seemed too much work to do. So I’ve been looking around for a craft that is different from embroidery (to give me a break) but that is easy to work on. I think I’ve found the perfect craft! Polymer Clay. It doesn’t need any special containers – in fact it can be left out in the air just about indefinitely. You can work on it a little and just sit it on the shelf. It’s very easy to clean up after and really a lot of fun. I set out to make something – I really didn’t care how it came out. I just wanted something that I could pick up for 15 minutes or a half hour to refresh my mind for embroidery. I’ve finished my first piece. In addition to the clay, I used shells, beads, even Angelina fibers! 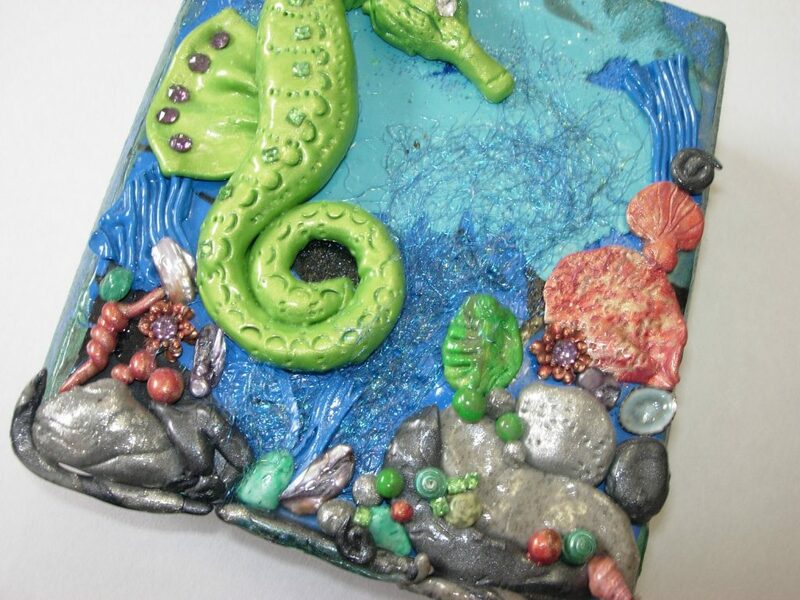 I looked on the net to see if anyone had used polymer clay and Angelina and couldn’t find any so I experimented. This little project has made me wonder if small FSL embroideries could be incorporated. Has anyone tried this? 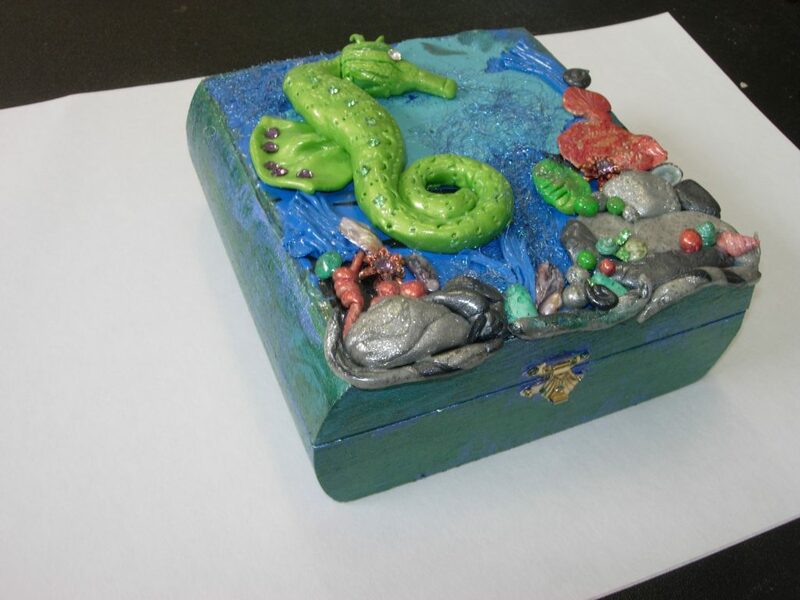 So here is my Under the Sea jewelry box. It’s certainly not a piece of art but it was so much fun!!! It now sits on a table under my Under the Sea Fantasy in my Bathroom. 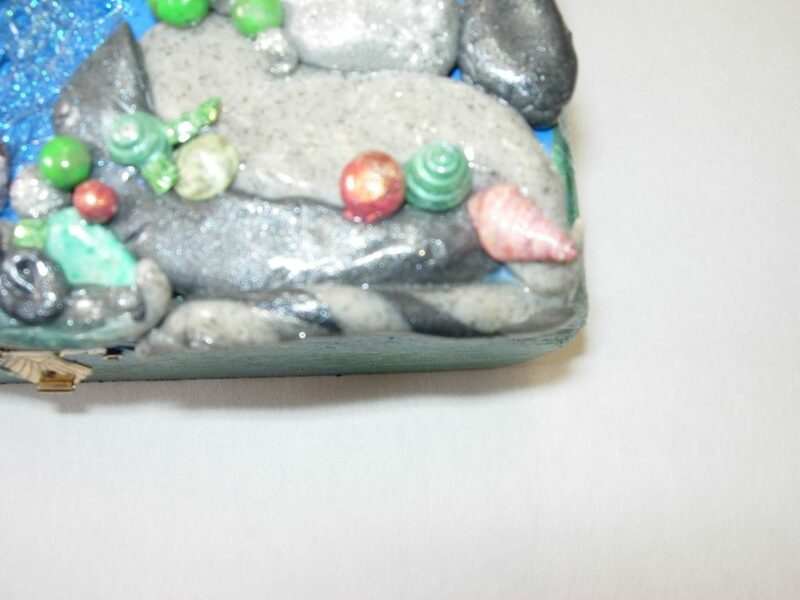 I just put clay on the cover of the box – I started with a thin layer. Photo isn’t that clear, but you see a couple of shells. The *beads* are just small balls of clay. More shells and some Mother of Pearl Buttons. I painted the sides of the box and covered the top with a couple of coats of glaze. You can see the Angelina Fibers on the dark blue water. I first pressed them into the clay – many times (LOL) They still were mostly just sitting ont he surface, but I was determined to get them onto the project. I just put some thick costs of glaze on top of the fibers. They look great in person! They have the shimmer and shine of Angelina, but also add a great texture to the surface. 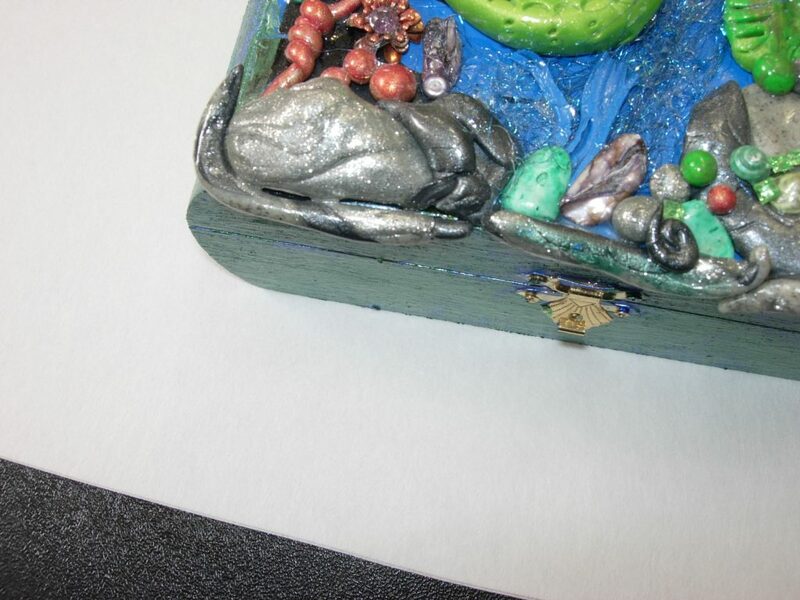 My final touch was adding crystals – his eye, on his fin, and among the bottom shells, rocks and beads. I painted the inside with a copper colored paint. I cut a piece of cardboard the size of the bottom of the box and added a layer of batting. I then covered it with a metallic fabric. I love your box Suz, well done and inspiring. I have never played with polymer clay but have considered it, now I might actually try it. 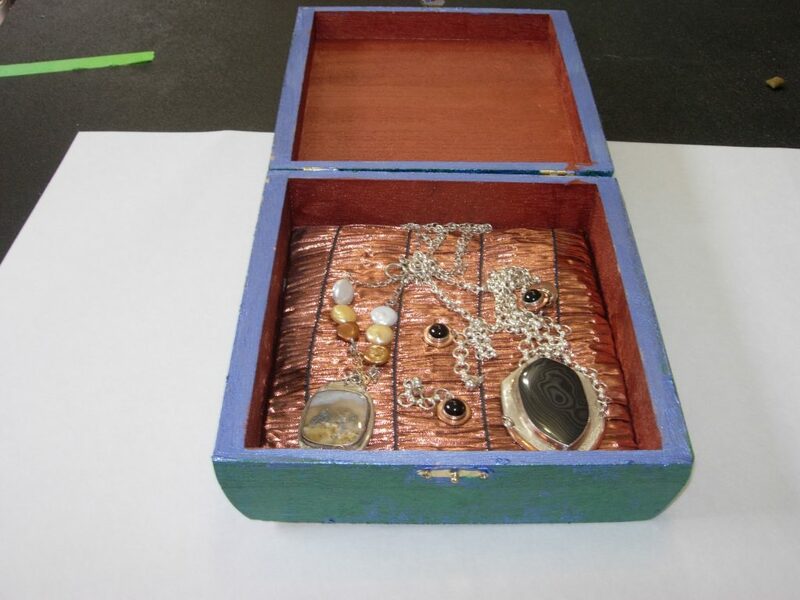 I do have a plane balsa wood box for storing broches that could use some jazzing up.